The empirical cumulative distribution function (ecdf) is closely related to cumulative frequency. Rather than show the frequency in an interval, however, the ecdf shows the proportion of scores that are less than or equal to each score. Empirical cumulative distribution function for the price data in Cars93. Look closely at the plot. When consecutive points are far apart (like the two on the top right), you can see a horizontal line extending rightward out of a point. (A line extends out of every point, but the lines aren’t visible when the points are bunched up.) Think of this line as a “step” and then the next dot is a step higher than the previous one. How much higher? 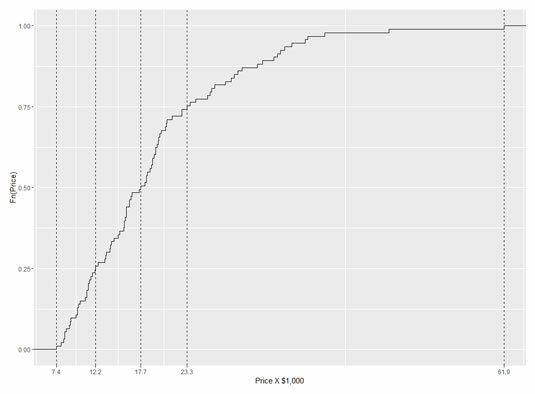 That would be 1/N, where N is the number of scores in the sample. For Cars93, that would be 1/93, which rounds off to .011. Why is this called an “empirical” cumulative distribution function? Something that’s empirical is based on observations, like sample data. Is it possible to have a non-empirical cumulative distribution function (cdf)? Yes — and that’s the cdf of the population that the sample comes from. One important use of the ecdf is as a tool for estimating the population cdf. So the plotted ecdf is an estimate of the cdf for the population, and the estimate is based on the sample data. To create an estimate, you assign a probability to each point and then add up the probabilities, point by point, from the minimum value to the maximum value. This produces the cumulative probability for each point. The probability assigned to a sample value is the estimate of the proportion of times that value occurs in the population. What is the estimate? That’s the aforementioned 1/N for each point — .011, for this sample. For any given value, that might not be the exact proportion in the population. It’s just the best estimate from the sample. 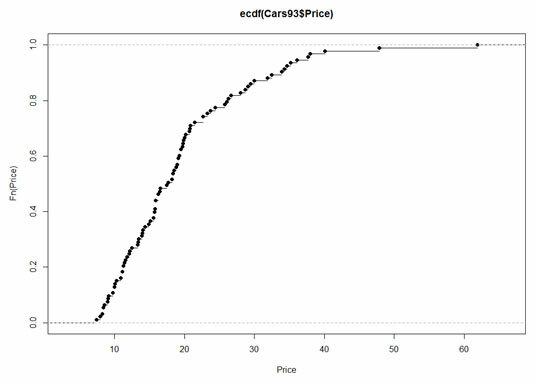 The ecdf for the price data in Cars93, plotted with ggplot(). adds the vertical lines. The aesthetic mapping sets the x-intercept of each line at a quartile value. result in the following figure. The ecdf for price data, with a dashed vertical line at each quartile. The ecdf for price data, with quartile values on the x-axis.